Learn weather words and how to spell them with this fun collection of flash cards, worksheets, puzzles, jigsaws and more! This set of eleven weather symbol posters is useful for vocabulary activities, or for displaying around the classroom when learning about the weather. 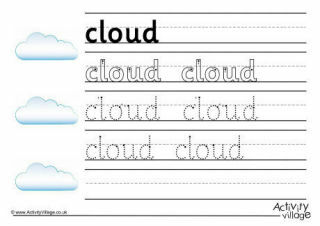 We have three variations of this lovely worksheet to download and print, which asks children to label the weather words by looking at the pictures. This printable set of water cycle word cards contains 15 words or phrases all associated with the water cycle process. Perfect for labelling diagrams and for vocabulary work. Here's a fun crossword for the kids to try, whatever the weather! Can they solve the weather-themed clues and complete the crossword puzzle? These lovely big colourful flash cards can be used in front of the class, put out on display or matched up with our word cards for all sorts of interesting weather vocabulary activities. Enjoy our weather picture crossword, perfect for younger kids. Look at the picture clues and fill in the blanks! Can the children recognise the different weather on these picture flashcards? They are big enough for group or whole class work. Here is a fun way to check whether children can recognise the correct spelling for some weather words! Can the children complete the grids and spell the weather words correctly? They can write the letters, or use some of our printable letter tiles. These lovely weather symbol cards are great for weather vocabulary work, displays or print several copies and use in matching games. There are 12 different weather symbols in this pack, with 4 on each page. Our weather vocabulary matching cards can be cut out individually and used for matching games or folded to make two-sided cards to test vocabulary. Useful in so many ways, this set of weather word cards can be used with our other weather printables, for displays, vocabulary work etc. Here's a fun word search puzzle full of weather words for the children to find. Can the children write the six weather words in the boxes below the pictures? The shape of the boxes provides a clue to the shape of each missing letter.